Written by LEYO. Posted on 13/10/2013. Filed under NEWS, RELEASES. No comments. 4lux returns with their Black Box Series. On this fourth volume you will find a track by Russian producer Kirill Tipo and two tracks by me, one of which is a collab with fellow Boogieman Special Mike. Big up to Gerd for this one! Written by LEYO. Posted on 26/07/2012. Filed under NEWS. 2 Comments. Written by LEYO. Posted on 03/05/2012. Filed under NEWS. No comments. Novation x Chico Mann put together a remix contest: Mad love for Chico Mann’s tunes as well as his Antibalas endeavours so having a go was a no brainer. I didn’t make the cut, so it’s up for grabs! Written by LEYO. Posted on 29/03/2012. Filed under NEWS. No comments. After Sotu the Traveller & dj Abstract I had the honour of mixing AJANAKU Mixtape NO.3. Ajanaku.com is one my favorite online magazines, so check it out! Written by LEYO. Posted on 07/11/2011. Filed under NEWS. No comments. This track is the result of a collaboration I did with Diephuis. Unsigned & up for grabs for all you scouting labels out there. Written by LEYO. Posted on 27/10/2012. Filed under BOOGIEMAN, NEWS. No comments. Releases on a.o. Room With A View & Objektivity and play some banging sets? We proudly present MARLOW (DE). ‘Look Over Feel’ came out on Dennis Ferrer’s imprint Objektivity and after his ‘Put Off’ EP on RWAV in 2010, this year saw the release of the well-received ‘This Is It’ featuring the wonderful title tune and the floorfiller ‘Need U’. 1 tune you were bound to hear last summer was his & Rainer Truby’s refix of the America classic ‘Horse With No Name’. Amongst our favorite contemporary producers and as a DJ he has an equally impressive track record with gigs from Panorama Bar to Tresor and from Paris to Copenhagen. Boogieman residents Leyo & Special will accompany him on this night and will do what they do best: nothing but back2back House, Disco, Boogie and everything in between. Written by LEYO. Posted on 05/09/2012. Filed under BOOGIEMAN, NEWS. No comments. 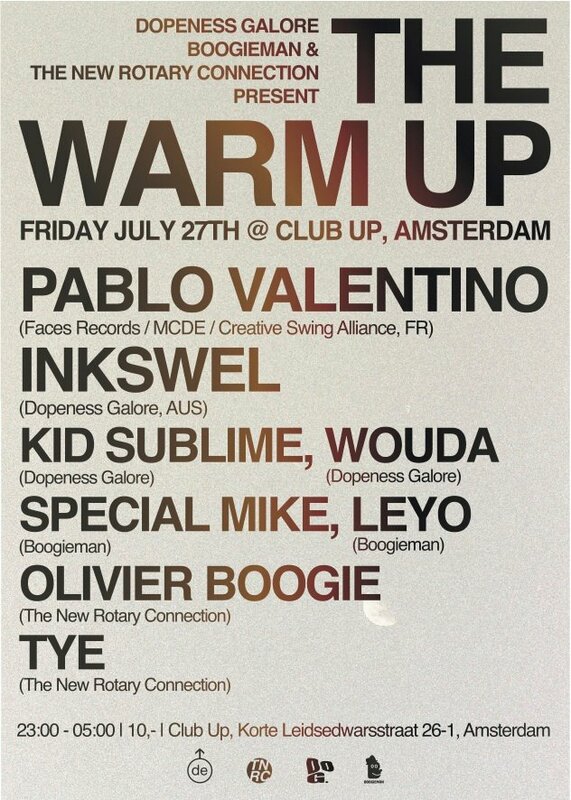 Special guest this time is DIP SOME: Head honcho of UpMyAlley, 123 Rakete and a few other things. A&R’ed the Beatnicks series and all other UpMyAlley releases & doing so introduced us to artists such as Hubert Daviz, fLako, Rustie, Shuanise or Mieux amongst others. Coming over from Cologne, this wicked selector is right UpYour… Alley. Join us once again as The Warm Up brings nothing but heat! Back all the way from Chi-town is Rahaan, who has been dropping disco and house beats since the 80’s. Written by LEYO. Posted on 11/08/2012. Filed under NEWS. No comments. 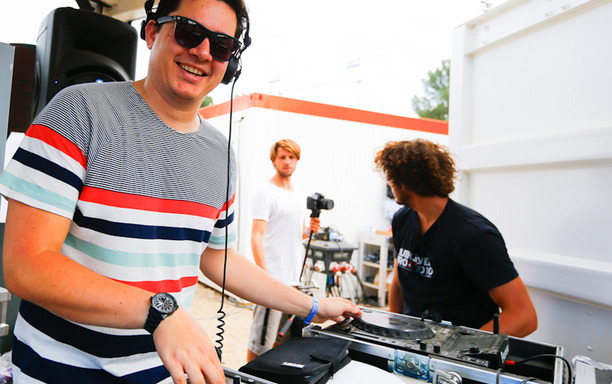 Recorded at Solar Weekend, here’s my set for Red Bull Music Academy Radio. Be sure to check out the others as well, including O.Boogie, Tom Trago, James Zoo & Full Crate. Written by LEYO. Posted on 07/08/2012. Filed under BOOGIEMAN, NEWS. No comments. 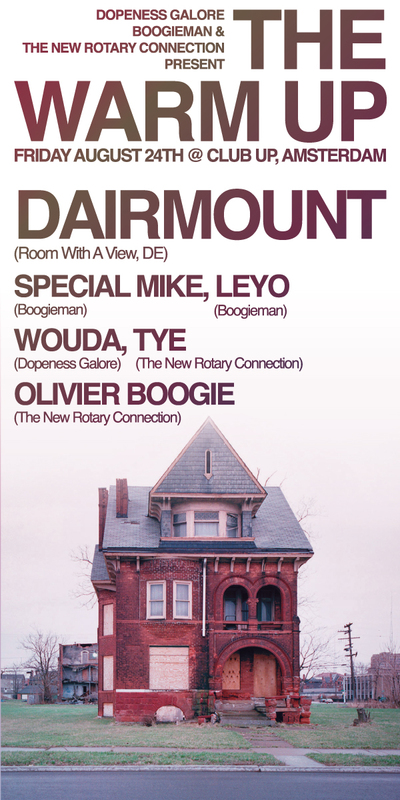 Special guest this edition is Dairmount: Founder, A&R & artist of Room With A View formerly known by most as Philarmonix. At one point editor of Plastiks magazine and like The Warm Up’s own Olivier Boogie & Leyo an alumnus of the Red Bull Music Academy. Room with a View is one of the most relevant House labels today, releasing nuggets by Dairmount, Art of Tones, Andreas Saag, Marlow, MCDE , Christo & André Lodemann to name a few. This guy knows his tunes, but don’t take our word for it; come down on the 24th and let your feet decide! 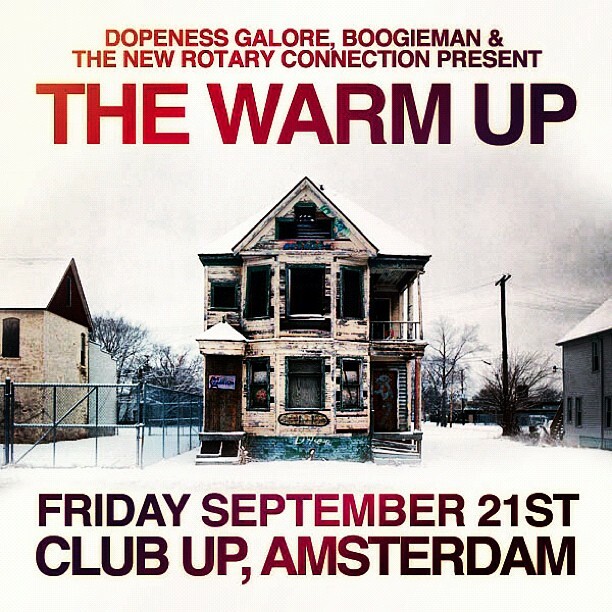 Dopeness Galore, The New Rotary Connection and Boogieman join tunes to bring you THE WARM UP: A new clubnight at Club UP focussed on the warmer side of all things House, wrapped up in Boogie and topped off with a few Disco sprinkles. THE WARM UP BRINGS NOTHING BUT HEAT. Get Barcelona Boogie for free! Written by LEYO. Posted on 03/08/2012. Filed under FREE DOWNLOADS. No comments. Download Barcelona Boogie or free, simply like & share it on Facebook and presto! Track made during Red Bull Music Academy 2008 in Barcelona. Written & produced by Leyo. Guitar by Jamie Woon (UK); bass by Robin Hannibal (DEN); Fender Rhodes & Roland 101 by Todd Osborn (USA); percussion by T’Amir Sweeney (USA); vocals & drum programming by Leyo. Mastering by Erik Breuer at the Brewery. Written by LEYO. Posted on 07/07/2012. Filed under BOOGIEMAN, NEWS. No comments. Pablo Valentino is all about good music, period. Always trying to explore but above all explode the boundaries. As label honcho of Faces Records, he is responsible for bringing us gems by Motor City Drum Ensemble, Jayson Brothers, L’Aroye, The Revenge, Simbad and himself to name a few. All the way from deep down under comes Inkswel: Genreless to the outsider, although stubbornly rooted somewhere between b-boy hip hop aesthetics and early house music fundamentals. Inkswel holds a strong affinity with soulful music from the past, present and future. Vinyl collector, analogue drum machine obsessive and always unconventionally funky. Joined by an assembled Amsterdam dance floor wrecking crew, THE WARM UP brings nothing but heat.